5 Halloween Treat Myths You Really Need To Know! Halloween will be filled with sweet treats, both gooey sugar-filled varieties as well as rich, creamy chocolate morsels. Here's what you should know. With Halloween right upon us, many of you are gearing up, choosing your costume and planning your parties. For some individuals who are trying to maintain a strict diet and workout program geared towards maximum fat loss or muscle building, the day may pose some feelings of anxiety. Tradition holds that the night will be filled with sweet treats all around, both gooey sugar-filled varieties as well as rich, creamy chocolate morsels to tempt your taste-buds, which will no doubt test your will-power strength. If you educate yourself about some of the common Halloween myths that tend to circulate around, at least you can feel informed going into this holiday. No one will be able to help you turn down the box of chocolates that gets passed around at your work meeting; that will have to come from within you. If you can make a few smarter choices though, if you do decide to give in, it won't mean you should add an extra hour of cardio each day in the coming weeks. With the current belief that carbs are the biggest evil and that low carbohydrate diets give you a straight up advantage for fat loss, people everywhere will be flocking to sugar-free candies. If you are one of those who believe sugar-free means a green light to indulge, you should think twice. If it's the hard candy variety then you will be right; these typically do contain much fewer calories, on average, coming in at about ten per piece. If you're debating about sugar-free chocolate though, that's where it gets dicey. Most often sugar-free chocolate will still contain plenty of fat calories, making it an even worse option in terms of total calorie content compared to a sugar-filled gummy candy (which are naturally fat free). You really have to know your sugar-free candies to feel as though you have permission to indulge. For those who are suffering from diabetes they are definitely hands-down a smart choice, but if you're simply looking to control your weight, be careful about these ones. Another problem that many people face on Halloween night is not so much a myth but more of an illusion. Most Halloween candy comes in conveniently small packaging and despite the saying, "good things come in small packages", for Halloween candy this could actually be worse. The reason is because if you were to eat a full fledged chocolate bar, for many people on strict fat loss or muscle-building diet, there would be a twinge of remorse. How much remorse depends on whether you had a scheduled 'cheat' that day and how flexible your particular diet is. But nevertheless, it was a chocolate bar and you ate it. Now, when you eat one of those mini chocolate bars, the thought process that often occurs is: "It was just a tiny piece, how bad could it really be?" You're right; one small piece really isn't that bad. Typically between 70-100 calories if you're talking a pint-sized Crispy Crunch, Snickers, or Kit-Kat. Nothing to get too worked up over. But the funny thing is that about an hour later, you may just find yourself eating another of those mini-do-no-harm bars. Then another, and another. By the time the night's over you've consumed a good eight or ten. A typical chocolate bar will add between 250 and 400 calories to your day, but eight of those seemingly harmless minis will set you back 700 to 800 calories. Chances are you would have never had two full chocolate bars in one night, but theoretically that's what you just did. When we're snacking and nibbling, that's when the calories really do add up. Unfortunately, for many people, 'nibbling' puts them in the mindset of very few calories actually accumulated. When they believe this, that's the biggest myth of Halloween. The third myth to be careful about is the thinking process that dark chocolate is "healthy". It's true, if you look at a piece of solid dark chocolate and a piece of milk chocolate, the darker chocolate is slightly healthier in terms of nutrition. But, let's call a spade a spade. Dark chocolate is still not as healthy as say an apple, a bowl of oatmeal, or a leanchicken breast. Those are healthy choices. Dark chocolate is simply the smarter choice between two treats. The moment you move it out of that "treat" category to be eaten in small amounts infrequently is the moment you're in for trouble. Don't let yourself fall into the trap of consuming large amounts of dark chocolate on Halloween thinking you're sticking to your "healthy eating plan". You aren't. 4. Are Those Raisins Really Your Friends? A popular treat among many this time of year is chocolate covered raisins. More so, they may even prefer chocolate covered peanuts, but everyone knows nuts themselves are very high in calories and fat, so cover them with chocolate and you're really headed for a problem. Because of that, they choose the raisins. They're fruit—must be a safe bet. In fact, if you look at the stats, 20 grams of chocolate covered raisins will contain 90 calories, 3.2 grams of fat, 14.4 grams of carbs (13.6 of those being sugar), and 0.8 grams of protein. In comparison, the same 20 grams of chocolate covered peanuts will contain only 19 calories more with a total of 109 calories, will have 6.7 grams of fat, 9.8 grams of carbs (with only 7.6 grams of sugar), and 2.5 grams of protein. So it's a pretty equal trade off. One has fewer calories but also less protein and more sugar, while the other has less sugar, more protein, and more fat—but it's partly healthy fat and nuts, when not covered in chocolate, are actually a very healthy food. So don't make the mistake of choosing raisins over nuts. If you really want the nuts, have the nuts. It might prevent you from eating five boxes of the raisins to try and kill the real craving for chocolate covered nuts that would have been satisfied by a single box had you given in. 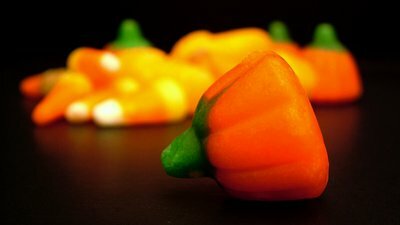 Finally, to add to the above myths, we have a tip for all of you who's main problem isn't avoiding candy at work or at any parties you are going to (for the younger parents out there who are handing out candy this Halloween), but rather reaching into the bowl and snacking between trick-or-treaters. The secret here is to actually purchase Halloween candy that you don't especially like. This is the simplest way to combat eating it while handing it out since the desire just won't be there. It's the same principle as "out of sight, out of mind". There will be a few of you who don't really care what type of candy it is, it's candy and you want it, but at least if it's not your favorite, you may limit what you eat to a degree. Second to this, also be sure your own kids place their candy in their room at all times, rather than storing it in the pantry or on top of the table. That will prevent you from turning Halloween into a weeklong affair. So this Halloween, keep these tips in mind. If you are capable of limiting the amount you indulge in, it doesn't have to be too disastrous to your diet.